7 hours, 44 minutes left! Where do I use my Morphy Richards voucher code? Grab a Deal or Discount of your choice from NetVoucherCodes and follow the link through to the Morphy Richards homepage. You may need to Copy the code if applicable. Start shopping for electrical goods and fill up your online basket. Once you have finished, head over to the checkout by clicking the trolley icon in the top right-hand corner. At the checkout, Paste your Discount Code into the ‘Voucher Code’ box and select ‘Redeem’. "Huge savings in the special offers and discounts section." The Morphy Richards online store lets you shop for kitchen and home appliances with ease. Find kettles, toasters, soup makers, microwaves, coffee makers, steamers, cookware, fryers and more for your kitchen, or pick up a vacuum cleaner, a steam mop, electric blankets, or irons to make for a more comfortable, more convenient home. Every item is the product of a renowned British design pedigree and crafted to the highest standards to ensure your satisfaction. To that end, every product unless otherwise stated carries a minimum 1-year guarantee, which can be extended to up to 5 years by simply registering the product with Morphy Richards. Morphy Richards sells vacuum cleaners and cordless vacuum cleaners with multi purposes and special designs that help clean even the dirtiest of floors. You can find everyday vacuum cleaners that can be used upright and handheld to clean the majority of your floors and those hard to reach areas. All the Morphy Richards vacuum cleaners are lightweight and have easy storage options, meaning they don't take up space in your home. With swivel design, options to extend vacuums to reach high up areas, and other great cleaning techniques, no matter what features you're looking for you can find them with vacuums at Morphy Richards. 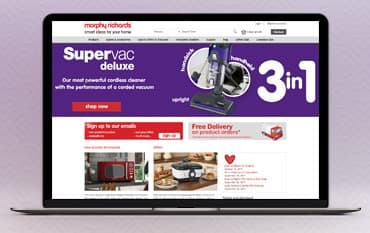 To save money on all your Morphy Richards vacuums and appliances head to Netvouchercodes now to grab a money saving voucher code from our deals page. If you're a keen baker and love making bread you need the very best breadmaker to make your finishing product as tasty and successful as possible. At Morphy Richards, you can find a huge selection of breadmakers with different features to suit your needs and bread making desires. Find fast bake 'cool to touch' breadmakers, multi-use and manual breadmakers as well as premium breadmakers. No matter which model you want or choose you can guarantee high quality with Morphy Richards and something that fits perfectly with the budget you're willing to spend. All the Morphy Richards breadmakers available are compact and easy to use with individual features that set them apart from other brands. Make sure to cut the cost of your breadmaker with one of our voucher codes which can be found on our deals page above. Iron's are essential if you want your clothes looking fresh, crisp and as clean as possible. To avoid water spills, burns and other annoyances which irons can cause, ensure you pick a good one, preferably from Morphy Richards! With years of experience in designing and creating premium appliances such as irons that work well and last a long time, you know you can rely on this trusty brand. Morphy Richards huge selection of irons enables you to find your ideal model. Choose via features, size and type to find an iron that suits all your needs, whether it's for your family home or commercial use. With steam irons, elite models, stainless steel irons, irons with ceramic sole plates and many more options to choose from you're bound to find your perfect product. And, with great affordable price tags and discounts available with our voucher codes, what a great incentive to buy. How can I contact Morphy Richards? You have 14 days from the date of receiving your product to return it. You will need to contact Morphy Richards to let them know you would like to return the product. You will then have to return the product to the address stated, unused and in its original packaging. As one of the UK's leading and most renowned brands for supplying excellent home appliances, you can be sure to find exactly what you're looking for at Morphy Richards. From cookware like breadmakers, kitchen appliances and cleaning solutions like irons and vacuums, plus much more, Morphy Richards is a well established brand bringing you innovative designs within its market. As a popular and trusted name, you can rely on any Morphy Richards products to be of excellent quality. Check here for all the latest deals and voucher codes brought straight to you here at Netvouchercodes.